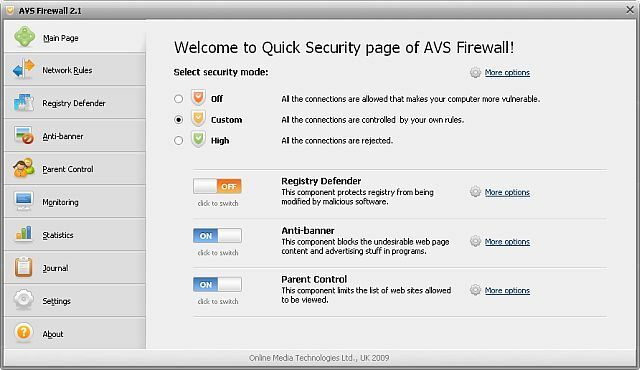 Protect your PC against malware and hacker attacks with AVS Firewall. Enable parent control and make a whitelist of sites to speed up your work with the Internet. Create your own rules for each application and specify exactly which connections will be used. Control your external and internal traffic. AVS Firewall is a part of the AVS4YOU package. Register once and work with over 20 tools from the AVS4YOU. Subscribe for $39/year or $59/lifetime. AVS4YOU tools let you easily rip, convert and edit audio/video files, burn DVDs, create ringtones, upload videos to portable devices, players, phones and much more! Protects your computer by preventing unauthorized network users and hackers. My Firewall Plus is an easy to use, advanced defense system for the home PC. FREE Comodo Personal Firewall - Complete security against Internet attacks. Keeps hackers out and personal information in. Check whether your Firewall leaks through. Qweas is providing links to AVS Firewall 2.1.2.241 as a courtesy, and makes no representations regarding AVS Firewall or any other applications or any information related thereto. Any questions, complaints or claims regarding this application AVS Firewall 2.1.2.241 must be directed to the appropriate software vendor. You may click the publisher link of AVS Firewall on the top of this page to get more details about the vendor.